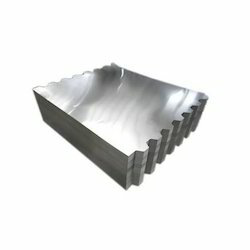 Our product range includes a wide range of tin free sheet. Tin Free Steel is an electrolytic chrome plated steel consisting of a thin layer of chromium and a layer of chromium oxide deposited on the steel base which gives it a beautiful, lustrous metallic finish on both sides. TFS offers outstanding corrosion resistance, lacquer adhesion as well as printability. No wonder it's an economical and high-quality replacement for Tinplate, especially for the screw and crown cap market. Tin Free Steel (single/double reduced) is available in the same range of dimensions/ temper/ mechanical properties and oil film.